OCEAN SPRINGS, MS (WLOX) - Administrators are working to keep parents' minds at ease in Ocean Springs. The Ocean Springs School District is taking a proactive approach to safety. 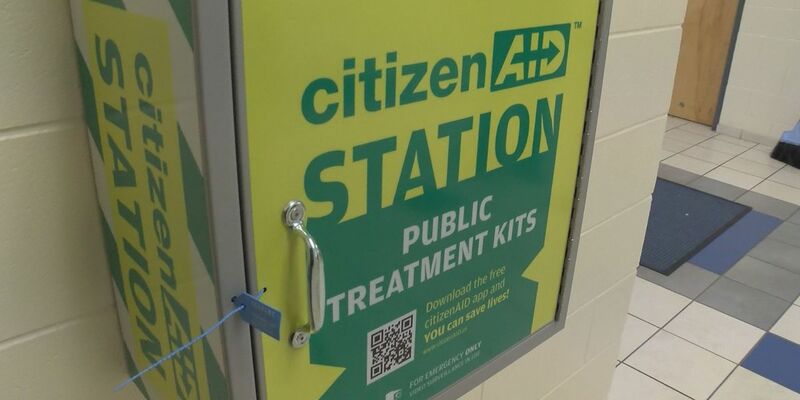 As Director of Student Services Grant Dickinson said, the new citizen aid stations are taking first aid to another level. Dickinson was proud to see the faculty of Ocean Springs School District stepping up and learning how to use the contents of the new aid stations. “Every individual from our cafeteria staff all the way to our superintendent has completed the training, and every new hire has to do the same thing before we get on the floor,” he said. For Ocean Springs High School Vice Principal Justin Sutton, this training means his teachers and staff are the first line of aid in a worst case scenario. "Once a situation is clear, teachers and people in the building are going to be first responders until paramedics and everybody can arrive," Sutton said. The response from parents has been positive. The boxes are placed in strategic places throughout each school. Inside, there are twelve packs complete with everything you may need to save a life. “This is just one more tool that we can use to keep all of our students safe at Ocean Springs High School and across the district,” Sutton said. But, he notes, safety begins with prevention. "This is the back end of the safety," Sutton said. "Safety comes on a lot of fronts. Reporting things, if you know something is going to happen, telling people. Teachers getting to know their students, know their personalities. Parents responding to kids and really treating their kids and making sure everything is the way it needs to be. That's where it all starts out in front." According to Dickinson, the boxes are placed in every school throughout the district as well as on buses and in sports facilities. They will be fully stocked and the program will be in full effect when students return from Thanksgiving break.